If your children enjoy go-karts as much as you but they are too small to drive at your neighborhood go-kart track then we can help! This is the moment when you decide to get your family their own go-kart so everyone gets endless amounts of gocart driving time. Adjustable pedals on this kart mean that this vehicle can grow with your family. As your kids get taller, the Torpedo adapts. This go-kart makes a perfect addition to the household, especially since it can easily be passed down from sibling to sibling. Trust us when we tell you that no kid is going to complain when they get a hand-me-down Torpedo. 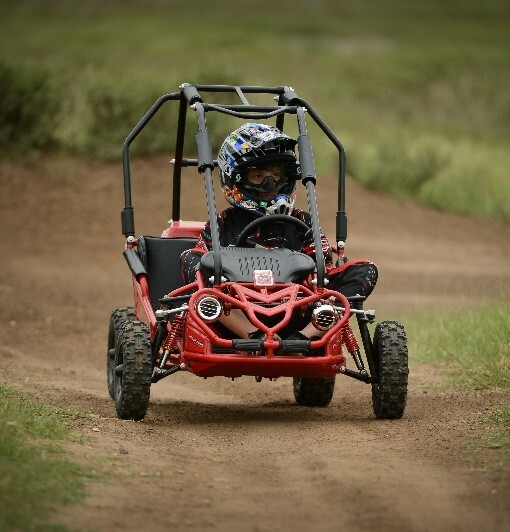 The Mudhead is a go-kart that is ready to make the best impressions and is sure to be the life of the party. With a passenger seat and a canopy top, your family will be ready to cruise through your backyard with ease. LED headlights make evenings safer, ensuring that you can always keep an eye on the family as they go exploring. As you pick out the perfect vehicle for your family, keep an eye on all of Hammerhead’s different go-kart styles. When it comes to the ideal way to spend a summer, we’ve got the solution wrapped up in four wheels. Keep away from the teenagers working their summer jobs at the race track, and instead, enjoy time together with your kids in your own backyard.